We’re off to the big white dyno at Lake Gairdner for speedweek 2015. 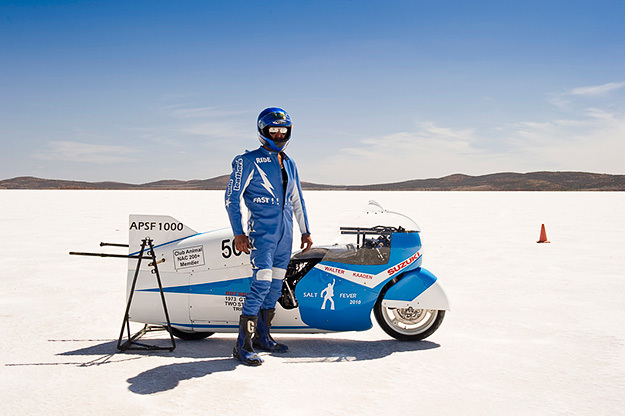 The image is of Brett Destoop, fastest man in Australia…… and the world in the APSF-1000 category. 232 MPH (371 km/h) Lake Gairdner. Thanks to Simon Davidson for allowing me to feature his image. You can see more of Simon’s work at his website. Skrunkworks will be campaigning Assalt – based on a 1987 BMW R80 with 1000cc barrels and heads. We will be entering the 1000cc pushrod, unfaired (no streamlining), gasoline, category. Gearing may be an issue: with a taller aftermarket 5th gear and the longest rear bevel drive available (32/11), we’ll probably need to spin the engine to 9000 RPM. Inlet valves enlarged to 46mm. Exhaust headers enlarged to 41mm or more. Heads ported to suit new valve sizes and dual plugged. extend sump + oil cooler. Wave tuned inlet and exhaust tract lengths. Stiffen the rubber cow’s frame – no tank slappers at +200km/h please. Extending swing arm to improve straight line stability. etc. etc – lots of them! So, there’s lots to do including building the dyno and dyno room and it remains to be seen how we’ll fair leading up to the Feb 2015 crunch time, but one thing’s for sure, it’s going to be fun! My shed mate Ross of Supacustom has hooked up with an old compadre of mine, Paul Chiodo of Peter Stevens Motor cycles.The pair will be campaigning a Triumph Bonne of noughties vintage. Ross will be responsible for modifying the rolling chassis while Paul and his cohorts will be herding a bunch of wild horses through to the back wheel via various highly modified mechanical contrivances. We’ve got heaps of work to do including building a dyno and dyno room! So strap yourselves in for an epic ride of a blog and PLEASE, leave comments and suggestions – doG knows we’ll need them! !